To provide focused specialization on problems in commercial and industrial real estate and to ultimately advocate for our clients in assisting them develop the most appropriate real estate decisions. We customize our expertise on details to provide cost-efficient solutions. Our proven record as commercial real estate counselors, expert testimony litigation support, development and real estate brokers help us analyze, evaluate and develop solutions in very high-end pressure situations. Our relationships are important to us because our clients are not only clients but often become our friends. 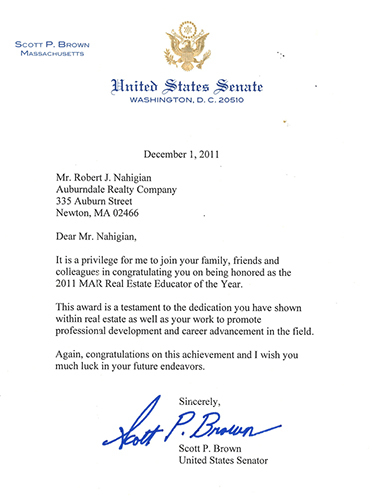 Auburndale Realty Co. was established in 1949 in Newton, Massachusetts originally as a residential real estate firm. Over the last fifty years, the firm has evolved from residential into one of the leading commercial and industrial real estate advisory and brokerage firms in the suburban Boston market with projects throughout New England and various locations in the United States. The firm has a local identity but with global commercial real estate connections through its affiliations. The firm focuses on commercial and industrial real estate assets on behalf of corporations, end-users, non-profits and high-net worth individuals from site selection to investment strategic planning to problem properties. Our three core services include: Corporate Brokerage, Real Estate Counseling and Professional Education/National Speaking. Uniquely this small boutique firm prefers to work on projects that require creative “outside-the-box” problem solving on suburban office, industrial and retail real estate. We thrive on distressed real estate and acute real estate problems. We are not as valuable with simple projects that do not require analytical and cognitive thinking. As a small boutique firm, we excel with solution development on the most difficult and challenging projects and thrive to create wealth for our clients. We do not engage every assignment presented to us but stay focused on projects that demand our core strengths. We provide counseling on strategic planning and enterprise alignment to incorporate commercial real estate to enhance a corporation’s or high-net worth individual’s bottom line. We have led many Fortune 5000 companies in the successful acquisition, disposition of excess commercial and industrial real estate and the leasing of such properties. The Principal is a certified advisor through CoreNet Global, Counselors of Real Estate, Royal Institute of Chartered Surveyors and The Society of Industrial and Office Realtors. He has been trained nationally as a mediator and professional negotiator. We serve as academic faculty and national speakers at many universities, regional and national conventions. As an individual certified real estate counselor (CRE), the Principal is an real estate entrepreneur who is passionate about helping others achieve their goals. We specialize in working with high-net worth investors and corporate accounts on problem properties or confidential strategic planning of commercial and real estate. We work with end-users as well as investors. We excel with detail and outside-the-box creative thinking to enhance the wealth of our clients. Let us go to work for you. Start by allowing us to meet with you about your end-user needs or investment planning. We work as corporate representatives both regionally and nationally with locally privately held companies as well as with national public accounts. We have dedicated ourselves to train and support nationally the next generation of top tiered real estate commercial and industrial real estate practitioners. We have provided in-house corporate training but are better known for our education at national, regional and local commercial boards and national commercial organizations.